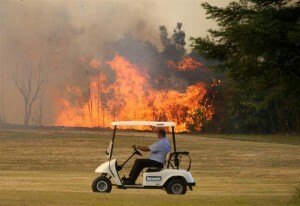 Titanium Club Wielding Golfers May Send Your Course Up In Flames! Researchers at UC Irvine recently released a study showing that club heads coated in titanium can ignite fires! Titanium clubs can produce sparks upwards of 3,000 degrees Fahrenheit which could easily ignite nearby plants, leaves, and grass on the golf course or driving range. After a series of fires have taken out a couple of California golf courses, many are debating whether or not titanium clubs should still be allowed on the links.